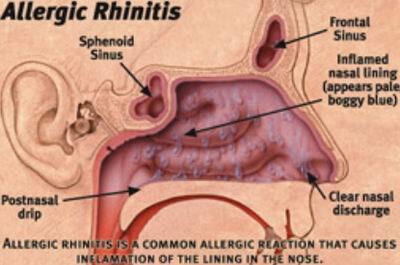 Allergic rhinitis is commonly called hay fever. Hay fever is also sometimes referred to as seasonal allergies, which can be triggered by the change of seasons, more specifically the changes in mold, pollen, and dander count in the air. Allergic rhinitis is one of the most common health problems in the United States today, as diagnosed cases are on the rise by nearly 10% over diagnosed cases of 20 years ago. The symptoms of allergic rhinitis vary greatly but specific allergen (the exact allergen or combination of allergens that trigger an allergic reaction) as well as severity of the allergy. Some patients complain of mild cold symptoms while other patients may develop chronic symptoms that are painful and interrupt the daily focus of life. Sneezing, itchy eyes, watery eyes, cough, persistent sore throat, runny nose, congestion, facial pressure and pain, and even the feeling as though the throat is closing are all common symptoms of allergic rhinitis. Hay fever, or allergic rhinitis, is caused by an inhaled allergen. An allergy is the immune system’s response to any type of molecule that is not recognized as friendly to the body, despite the fact that it is potentially harmless. It is often described as the immune system going “haywire.” The immune system will mark the specific allergen with an imprinted memory known as Immunoglobulin E. From then on, every time the specific allergen is inhaled, the immune system “remembers” it and reacts in an effort to protect the body. Of course, because there is no real and actual danger, the immune system is simply making the body uncomfortable. Histamine releases the mucous, which is designed to protect the body, which often makes allergy sufferers terribly uncomfortable. Allergic rhinitis can be triggered by tree, grass, or weed pollen, fungi and mold spores, dust mites, animal dander, cockroaches, and indoor mold spores. Heredity can often play a vital role in determining who is affected by hay fever and who isn’t. Risk factors for developing allergic rhinitis include gender, more common in males, family history, the seasonal pollen rates at birth, firstborn children, exposure to dust mites, and exposure to second hand smoke. Diagnosis is based on a combination of the patient’s answers to questions during a routine health examination, which may be followed up by an allergy skin test. Allergy skin tests are simple. The patient generally endures a few scratches on the back or the arm of allergen fluid. Those areas that react or determined to be an allergen. Blood tests can be used as an aid to diagnosis. In most cases, the only complication arising from allergies is the quality of the patient’s life is most definitely affected. Few patients develop anything more serious, although a small percentage may have underlying health issues. In a very small percentage of patients, eczema may develop, and if the allergies are chronic, sinusitis may become a chronic battle. Patients with other breathing difficulties such as asthma will have a much harder time managing their regular respiratory treatment. Many patients with breathing problems require additional medications, inhalers, and even nebulizer treatments in the home. The treatment varies by degrees of discomfort. Some patients do well with over the counter medications. Nasal spray and eye drops can often relieve the symptoms if they are not overwhelming. For more persistent allergies, many doctors will prescribe corticosteroids. Antihistamines, decongestants, cromolyn sodium, and leukotriene modifiers are all very common medications to help control the symptoms. For severe allergies or for patients who have a hard time adapting to medication, immunotherapy might be recommended. Immunotherapy, which is commonly referred to as allergy shots, are a specialized mix of serum which contains the allergens to which the patient is intolerant. Over a period of weeks, months, and years, there is a subtle increase in the allergens, introducing them to the body slowly to desensitize the immune system. Most patients can help themselves by reducing the allergens that they are exposed to. Using climate control rather than opening windows in the home, keeping air conditioning filters clean in the home and car, avoiding pets, regular cleaning, staying indoors on high allergen days, the use of HEPA filters, and the use of a dust mask during high incident activities can help keep allergies under control. Trusted dedicated online pharmacy to buy priligy and viagra in south africa · Specially selected generic ed tablets such as cialis australia · and Buen lugar para comprar cialis en españa.